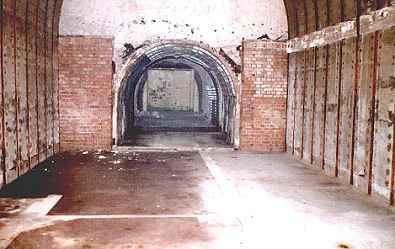 Below: same location in August 2003, 59 years after the above photo was taken. The hanger for the mezzanine gallery can be seen on the top right, and the supporting post fixings can be made out on the floor. A variation on the photo above showing more clearly the mezzanine gallery and the coat of arms. 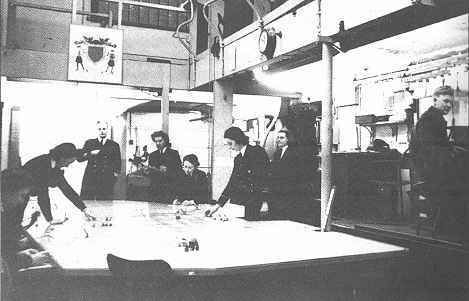 This plotting room is sometimes referred to as the Map Room. The coat of arms as shown in the above photos. 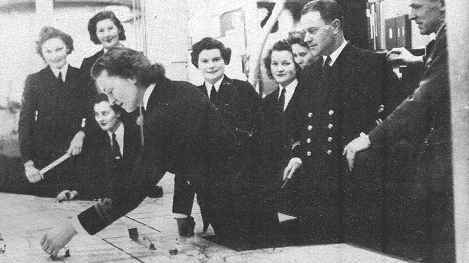 It demonstrates the link between WRNS (Womens Royal Naval Service) and WAAFS (Womens Auxiliary Air Force) who worked in the Plotting Room. 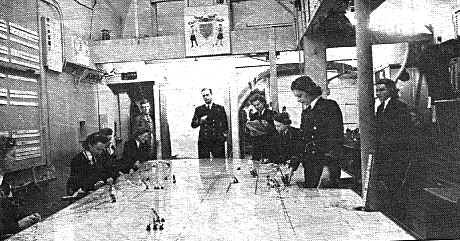 Designed by Miss C Ward (WRNS) in 1944 it is currently housed in the D-Day Museum Portsmouth. Were their skirts really that short? 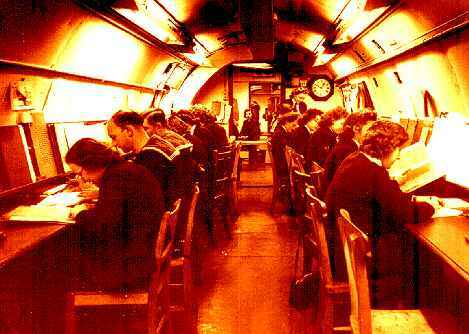 The Coastal Forces (Channel) plotting room with King George VI in the background. The English southern coastline, including the IOW, is displayed on the right of the table. 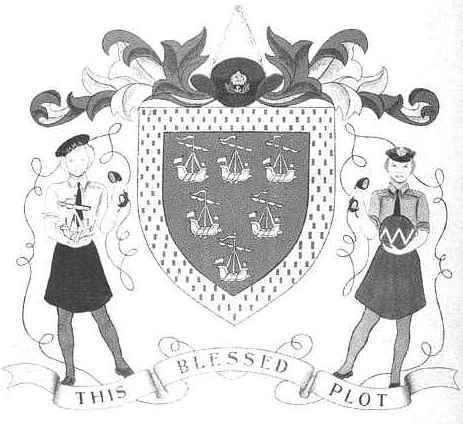 The Wren on the far right of the base of the plot table is Leading Wren Christian Gordon. The king's visit was some 3 months after D-Day. 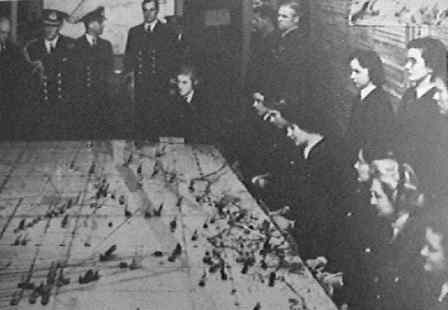 The plotting room had been asked recreate the surface activity in the channel during the initial phase of the invasion for the visit, and the view in the photograph shows the surface activity at about 12.00 noon on D-Day. Whilst all the Wrens sitting on the right appear to have head phones connected there were only 2 or 3 sockets as the plot table was staffed by a fraction of the number of the people shown. 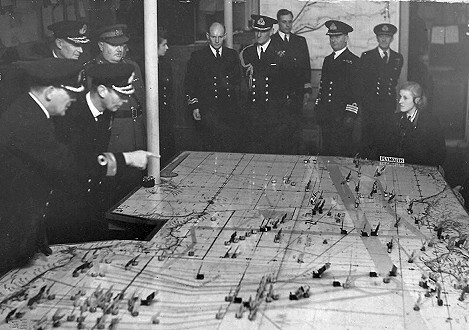 King George VI - second from the left in the foreground - examines the plotting table. There are more pictures of this kind on the next page. The plotting room this time it's a WRNS turn to pose. Is that Harry Enfield second from the right? 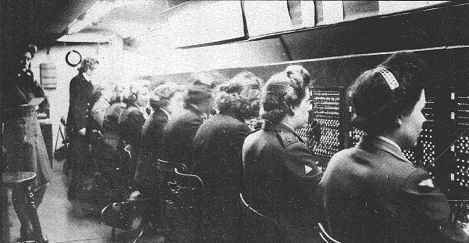 The main telephone exchange, was staffed by ATS, WRNS and WAAFs. This photo of 'A' watch in the message decoding room was supplied by Sue Solly after she heard me on BBC Radio 4 talking about the UGHQ. Her father Philip Brady was a Leading Coder during WWII and had this photo as a keepsake. Veronica Owen is 3rd from the right. See the letter from Gladys Dutton below. 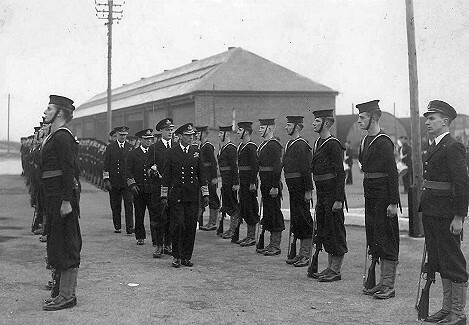 King George VI inspects the troops on 16 November 1944. 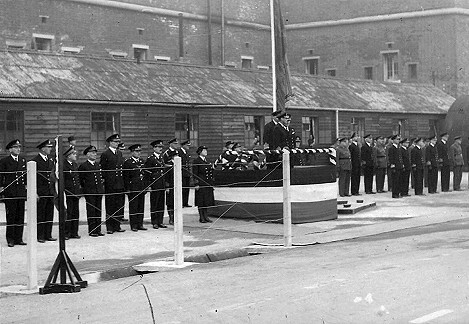 The building in the background is the FOF3 (Flag Officer Fleet) building, now part of the DVLA test centre opposite Fort Southwick. The saluting base for the King. The temporary accommodation hut has long since disappeared but the location of the base can still be determined as the rainwater ditch in front of it still exists. 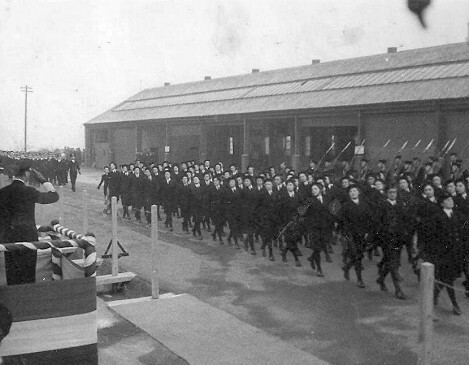 The King takes the salute from a contingent of WRENs during the March Past.